My Tuesday night evolved in the strangest way into an odd, albeit rewarding evening. Last week after my weekly coffee with the the boys at Cafe De Arts, I got a text message from my friend Claude who asked if I wanted to get together next Tuesday. I mentioned it to Donna, and she said it was probably because she was hosting 10 women at our house to assemble sandwiches for the Guest House of Milwaukee. Claude knew I would probably want to get out of the house, so felt it would be a good chance to get together for a beer. So we set a time and a place (Bernies Taproom a local bar) and I mentioned he should invite the other guys from coffee and some others from CollectiveMKE, our church. Then he said, "Maybe we could even make sandwiches while we're there. Now, to be honest, I thought this was a little crazy at first. I am one of those people that worries entirely too much what people think. (Though as I get older, I seem to be caring less.) So, to propose a bunch of guys assembling sandwiches at a bar just seemed like a stretch. Nevertheless, I told him to see if they would mind, figuring they would say no, and that would be that. He texted me later that day and said that "Karen said we're more than welcome to." So much for my great intuition. We met at seven o'clock and each ordered a beer. Bernies has a fantastic selection of beers, so it has become our favorite local place on occasional night we get out together. We each carried in our bag of bread, meat and cheese and gathered around a table. They have picnic style tables that are perfect for this kind of thing. And we started putting sandwiches together. We drew some stares for sure, but after a couple of minutes people kind of forgot what we were doing. As we put them together, we talked smart and solved huge world problems. One of my friends even went so far as to say, "Wouldn't it be cool if everyone in the world made sandwiches for like three hours? World hunger solved!" We talked about all that is going on in our country today a bit too. It was cathartic to have a couple of beers and laugh hard with one another while doing something positive for the world (albeit a local men's shelter) at the same time. I'll be frank with you and say that these past two weeks have been extremely difficult for me - lots of different emotions - so to put them aside for a couple of hours and blow off some steam felt really good. When I got home, the last of the ladies were saying their goodbyes. Donna mentioned that collectively they had made 450 sandwiches. If you throw in the 50 my buddies had assembled, it totaled over 500 sandwiches. 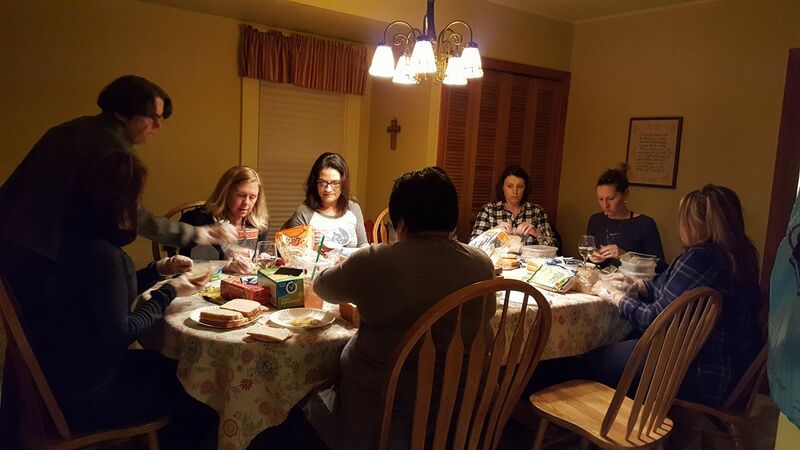 Plus Donna's friend Jill Krey hosted her own sandwich night in Bay View and they made another 300. These are significant numbers, and I don't write this to get a pat on the back. I only write it to show how an ordinary night with the guys can turn into a super positive night if someone gets an idea in their head. I write it to encourage anyone who is all ragey about the political goings-on at the present time to take action to make the world a little better place. And I write it to thank all those guys and women who took time out of their lives last night - and in the past - to step into the lives of others and lend a hand. Because while there's not much we can do about Washington, there's something we can do closer to home.